A tourist hot spot promising quintessential sunshine and moderate year-round temperatures, the visually stunning island of Tenerife boasts panoramic views of the Atlantic Ocean and the impressive 12,199 foot, snow-capped Mount Teide volcano. Leisurely lounge on the glittering shores of the endless coastline. Scuba dive to the reefs below. Windsurf, soaring above the vast open seas. This Spanish paradise promises endless entertainment with exciting outdoor adventure, charming shops and stores, historic sites and a vivacious nightlife.A Moorish-inspired, tiered resort off the coast of Africa, Sunset View Club is situated at the heart of the Golf del Sur estate on the southern tip of Tenerife. Retreat to a seaside haven where a friendly and welcoming atmosphere awaits with comfortable and relaxing accommodations. Indulge in the convenience of spacious living arrangements adorned with charming appointments and modern furnishings, and equipped with a partial kitchen. Enjoy our 1 bedroom accommodations featuring a comfortable bedroom with double bed, flat screen TV and a full bathroom with shower and bath. Enjoy the convenience of the partial kitchen equipped with a refrigerator, microwave oven, dishware and coffee maker. Relax in the fully furnished living space with flat screen TV and DVD player. Additional amenities include air conditioning, telephone, iPhone/iPod base, safe (charge) and a lovely balcony or terrace. Our spacious 2 bedroom accommodations feature a master bedroom with a fully equipped en-suite bathroom, a second full bathroom, a lounge and a dining area. The partially equipped kitchen has a microwave oven, a refrigerator/freezer and many other modern appliances. Additional in-room amenities include air conditioning, TV both in the lounge area and master bedroom, DVD player, telephone, safe (charge), iPhone/iPod base and a big terrace or balcony. Directions to Resort: (From Reina Sofía airport) Follow the TF1 signs to Los Cristianos and take the first exit (24). Now follow the signs for Los Abrigos and Las Galletas NOT SAN MIGUEL. Turn right at the roundabout following the signs for TF65 (El Guincho, Los Abrigos). Follow the signs for Golf del Sur (on the right). Go across the roundabout into Golf del Sur. Bear right and follow the road round, passing the Sand Club on the right. At the sign for Sunset View, turn right and right again. The resort is on the right, opposite a row of bars and restaurants. The reception is through the car park. The journey time is approximately 15 minutes. Directions to Resort: (From Los Rodeos airport) Take TF5 south after approximately 3km take the turn off sign posted Los Cristianos. This will take you to the junction of the motorway TF1. Follow the sign posts for Los Cristianos and South Airport. Take the first exit (24) follow the signs for Los Abrigos, Las galletas NOT San Miguel. Turn right at the roundabout and across at the next, following signs for TF65 (El Guincho, Los Abrigos). Follow signs for Golf del Sur (on the right). Go across the roundabout into Golf del Sur. Bear right and follow the road round, passing the Sand Club on the right. At the sign for Sunset View, turn right and right again. The resort is on the right, opposite a row of bars and restaurants. The reception is through the car park. The journey time is approximately 60 minutes. Kennel: Residencia Canina "Don Perro," Las Chafiras, 922 735 824; 2km from resort; Hotel Canino "El Ancón," Arona, 635 922 808; 15km from resort. Shops hours from 10:00 to 22:00. As part of our continuing efforts to maintain and enhance the resort, we would like to inform you that construction noise may be considerable during this refurbishment programme. We will make every effort to keep the common areas clean and minimise service disruptions during this time. We sincerely apologise for any inconvenience this may cause you and thank you for your kind understanding. Enhance your trip with Diamond Experiences Plus - fun activities to help all guests turn a stay with us into an unforgettable vacation. Check our events calendar to discover the experiences available to you at Sunset View Club. Contact the resort for more details and to book before you arrive! We invite you to dine with us on site at JP Sunset View Club. Step into the welcoming atmosphere of this friendly restaurant featuring an extensive entertainment program and an international menu that is sure to satisfy everybody´s appetite. Savoury dishes and delicious snacks are available for dining in, or for take away. We even offer a poolside bar so you can enjoy our flavourful fare while soaking up the sunshine. Check out our timetable of live entertainment. Book your table in advance. Are you celebrating a special occasion? Island Spirit Restaurant would love to help you make your day memorable. Call us on +34 922 73 87 63, ext 807 today! We partner with specialists in wheel chairs, electric scooters, excursions and more. Please ask at reception. Free Wi-Fi is available at the property. 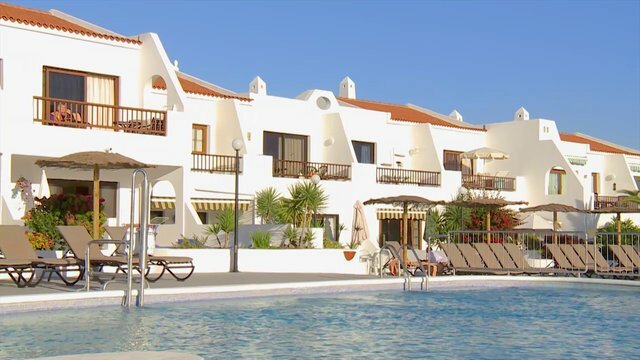 Highlights: Sunset View Club boasts a relaxed atmosphere and is situated in a residential complex close to the PGA-approved courses of Golf del Sur. No steep gradients or inclines however the resort is built upon a slight hill. Pathways are well maintained and accessible by wheelchair with ramps in places. All areas have easy access. Next to car park and main entrance into the resort – street level. Situated next to Reception – one level. Consisting of one big pool and one for children. Both are heated (during winter season) and, together with the whirlpool and table tennis, make this area especially entertaining and relaxing for our guests – Ground level. Pool hoist. Pool has a brand new ramp. Night entertainment once a week at the restaurant – Ground level. Situated next to the Housekeeping department, with ramps for wheelchair and trolley access. Main car park right in front of Reception with additional car park facilities on main road and back of the complex all close to accommodations. Currently there is no accessible parking bay. We offer two accommodations in total: 2 one-bedroom accommodations. Most resort accommodation is based on two floors with stepped access. There is no lift/elevator. Only 100 m from main shopping centre in the area (San Blas) which has shops, restaurants and bars. Accessible beaches: El Medano (8 km), Los Cristianos (18 km), Las Americas (20 km). Restaurants, Beach, shopping center are accessible (S. Blas). Not all buses are wheelchair accessible. Adapted taxis are available upon request at Reception.